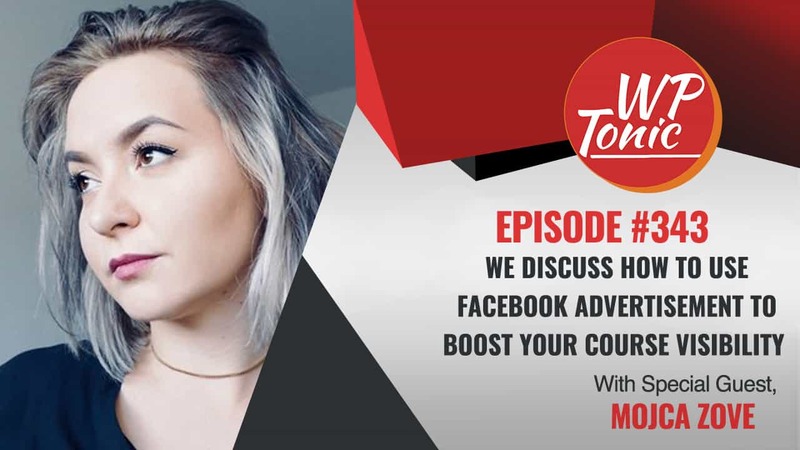 We Discuss With Mojca Zove (formally Mojca Mars) How To Use Facebook Advertisement To Boost Your Course Visibility & Get More Online Sales! When was the last time you were really satisfied with your Facebook Advertising results? So satisfied in fact that you had absolutely no problem with increasing your investment? Boosting a Facebook post or launching a simple campaign isn’t enough to succeed anymore. What you need is a clear plan and a strategy. Facebook Advertising policies Cheat Sheet: Avoid getting your ads disapproved and your account flagged. Jonathan: Welcome back folks to the WP-Tonic Show. It’s episode 343. I’ve got a great guest Mojca Zove. I think that’s the best I’ve done so far. Mojca: That was so good. Jonathan: It was, wasn’t it? Even for a cranky old person like me, I can do something right, can’t I? Would you like to quickly introduce yourself to the listeners and viewers, please? Mojca: Yeah, sure. Thank you for trying so hard on pronouncing my name correctly. That was really good. So my Mojca and I’m a Facebook ads expert. I work with +7-figure businesses. I help them develop and implement Facebook advertising strategies and it all got started with me actually getting fired from my previous job and that’s how I kind of ended up here. I have my own boutique agency at the moment called Super Spicy Media and I’m trying to keep it spicy with helping as many people as possible just up and going with our Facebook advertising strategies. Jonathan: Mojca is an old friend of the show. She’s tolerated butchery really graciously. Cindy, would you like to introduce yourself to the listeners and viewers? Cindy: Sure. Hi, everyone, Cindy Nicholson here. I’m from TheCourseWhisperer.com and I help entrepreneurs that want to create online courses. Jonathan: Right. So, we’re going to be delving into social media with a specific emphasis on Facebook advertising aimed at the course owner, the membership owner. But before we go really down into that, my first question is, could you tell us a little bit about how you got where you are today? What led you into the crazy world of social media? Mojca: I wanted to do something that was fun and I already spend just too much time on Facebook and on social media so I decided, “You know what? What if I do something with that and just find a reason to spend even more time on Facebook and social media? So that’s how I pretty much decided that I want to do, I started first by developing general social media strategies for Twitter, for Facebook and so on. But then, after a while, I decided to niche down on Facebook advertising because first of all, it was very compelling to me. The features that they launched. All of the possibilities that are available within the ecosystem. It was just so attractive and I love the fact that it was so tangible so you could pretty much set up a campaign and track the exact purchases and conversions that you were getting from Facebook ads. So I love that aspect of it and that’s how I decided to niche down on Facebook ads and I’ve been doing this I think, for more than 2 years, just specializing on Facebook advertising and learning all about it and teaching all about it. But everything got started like I mentioned before, from losing my job. I was previously a copywriter at an advertising agency and we didn’t go along very well so I got fired after a while and just went on my own and did my own thing. Cindy: So what made you decide to go from the corporate world working for somebody to deciding to actually go on your own there? Mojca: So I absolutely hated all of the different levels that I had to go through. I was a copywriter on paper, but I did pretty much everything and whenever I had an idea and I had a copy, it had to go through all different levels in order to get accepted and then again through all different levels in order to get the feedback and I just hated that and I didn’t have any say in how to, I wrote the copy, but when it came to like the larger scale and ideas and so on, I didn’t have any say in it and I wanted to be my own boss. I hated going to the office. I hated the 9 to 5 aspect of it. I hated that I couldn’t work from home and since I was in a creative business, I tried talking to them about this and I tried saying, “You know what? I’m more creative in the evening,” but they just didn’t listen. So they were like, “No, you have to there 9 to 5.” And I hated that so I got myself fired because of it. Jonathan: That’s great. So why do you think people struggle so much with Facebook advertising and what are a couple of the basic mistakes that you see a lot of people making with it? Mojca: The number one reason they’re not succeeding is because they don’t have a strategy. Everyone wants to do Facebook ads, but not everyone takes the time to actually sit down and educate themselves about the strategy and what their goals are and how to develop the strategy around those goals and the step by step process behind it. They don’t educate themselves about different features and how to get started because it’s so easy to open up your Facebook advertising account and just launch a campaign. And because it’s so easy, everyone just starts advertising their paid services and their paid products without investing in all of those different steps that come before that like generating traffic to your web page, generating leads and so on, I don’t know, running ads to your webinar. They don’t really invest their time and money into that, but they go straight into promoting their paid services or product and they’re unsuccessful because of it. It’s just not educating themselves about what they need to do basically. Cindy: Yeah. It’s interesting because you’ll often see that on Facebook, people talking about how Facebook ads don’t work for them or they spend this amount and it didn’t work for them and I think there’s a lot of reservation or people being tentative about going down the Facebook ad because you have to make this investment. Cindy: So if somebody is just kind of starting out with Facebook ad, you talked about the strategy, what are some of the specific things they should be thinking of before they actually go to spend the money? Mojca: So the first thing that they should do, when they just start thinking about running a campaign, they don’t need to have a launch date or anything like that. They don’t need to say, “Yes, I’m launching the campaign next week.” When you start thinking about it, the first thing that you need to do is implant a Facebook pixel to your web page. When you do that, you’ll be able to generate a lot of data about your users before you even start advertising. And once you decide that yes, you want to launch your first campaign now, you’ll be able to retarget all of your website visitors and all of that data will generate before you even start. So that’s one of the first things that they should do. And the second thing that I really emphasize when talking to, not just my clients, but the students to my course, when I talk to them is, when you launch your first campaign, in order to get really excited about all the different possibilities, you need to establish that first tiny win. If your first campaign is unsuccessful, you’re probably not going to continue. Cindy: She froze on my side, Jonathan. Mojca: I think Cindy froze actually. Jonathan: Yeah. Cindy that’s frozen. There we go. Jonathan: So, I think what you just said was great. So, when it comes to actual people that have got online courses or membership sites and they’ve built it on WordPress, which they should do, I’m only slightly biased, got any tips how they could get started with using the power of Facebook advertising to promote that course? Mojca: The course? Yeah. So, first of all, the good thing about WordPress is that there are a lot of different plugins that you can take advantage of if you’re not really technical savvy. That’s why people use WordPress. They don’t want to focus on the code. They don’t want to have anything to do with the code so they do WordPress and download a bunch of plugins. So you have a lot of plugins for Facebook as well. First of all, if you don’t want to mess with the code, with the Facebook pixel, you can just go ahead and download a plugin for that and paste the Facebook pixel id in there and you’ll have a Facebook pixel implanted on your web page, so that’s the first thing that they should do. And the second thing, what I really recommend and it kind of ties back to the question about where they should start and how to establish that first tiny win, what I would really recommend is not starting by advertising their course and trying to generate as many purchases of their course as possible, but I would start maybe a step backward and trying to generate leads. Leads that kind of tie back into the Email Marketing software that they use and then use those leads to guide them through an email sequence and at the end of that email sequence, you promote the course to them. So that’s what I would do because you’re able to establish that tiny win and feel good about the campaign that you just launched, feel good about the results that you’re generating and you can continue on from there and you’re going to be in a much better mood a lot more excited than if you start promoting the actual course and don’t make any sales and you just leave it altogether. Jonathan: Yeah. I think I’m getting the picture that you’re trying to draw here Mojca. Are you really saying unless you’ve got a lot of online credibility or a lot of relationship with a substantial audience, to sell straight away through Facebook is going to be difficult? I think that’s what you’re saying, isn’t it? Mojca: Yes, because selling courses on Facebook, it’s not really difficult, but it’s difficult if you start your Facebook advertising education and if that’s your first campaign that you launch through Facebook. If you do that, then it’s definitely going to be hard. What you want to do first is you want to do, like I said, that tiny win in order to see how everything is working together. What you should be careful of, what you should keep your eye on and then, when you realize all of that, when you learn from your first campaign, when you start generating some sign-ups and you see what you need to be careful of, that’s when you can say, “Okay. Now I’ve gotten some sign-ups. I see that I have some credibility with my Facebook ads and I can continue investing in promoting the video course. Jonathan: Yeah. I might be a bit slow here. I just want to kind of pin this down. So what I think you were saying there is it’s not that you couldn’t sell direct, the courses, it’s that if you’re starting off, your challenge should be manageable and where people go wrong is they try and sell direct, their course and you need experience and you need a build upon knowledge before that could even be possible. Have I got that right? Mojca: Yes, that’s perfectly and that’s a great sum up. Yeah. Jonathan: Oh, that’s great. I got something right so that’s good, isn’t it? It’s been one of those mornings. I’ve had plumbing problems audience. I’ve had the plumbers in. I’ll throw it over to Cindy. You’ve got a question, Cindy? Cindy: I lost you there for a bit so I don’t actually know where. Jonathan: Oh, so, yeah. I better continue actually. Jonathan: Cindy had some trouble with her Zoom. With that strategy which you outlined, so I think what would be a good strategy is if you’ve got some free lead magnet that is related to the course that can give some value and maybe set up a landing page or a Facebook advert to a landing page which offers that lead magnet which has some strong linkage to the course. Would that be a good strategy? Mojca: That’s a great strategy and that’s something that I do as well. So I have a course teaching Facebook advertising and how I start generating some traction to by advertising a free email course about Facebook advertising. So it kind of ties, that free email course ties into the actual paid course that I sell online and that’s what I do and that’s what works. Like I said, just starting with something manageable which is a great way that you put it. So starting with something manageable, establishing that first tiny win, seeing what you need to be careful of and that’s when you continue. Jonathan: Oh, that’s great. We’re going to go for our break folks. We’ll be back. We’ll be discussing more Facebook advertising with the master Mojca Zove. See I’m doing well now, aren’t I? Jonathan: I’m on a roll. We’ll be in a few moments folks. Jonathan: We’re coming back. My morning’s getting better. I’ve had a bit of a session with the plumbers, but my pronunciation of my guest’s name has improved dramatically. Cindy, you’ve got a question? Cindy: Yeah. Thank you. Sorry, I dropped off there for a bit so I apologize if I’m duplicating some of the questions. So you were talking about a strategy to advertise for your online courses. Would you recommend that you go through the strategy versus advertising the course itself at the outset? Is that what you guys had been talking about or would you take this softer approach in terms of offering something of value first versus hitting them with, say an online course at the beginning? Mojca: I definitely recommend advertising the course as well because it’s something that, it’s tangible, when someone purchases a course, you can tie it back into Facebook ads and say, “Okay. So, I spent $200 on selling a course that’s $800 profit. Let’s invest more.” As we mentioned previously, I wouldn’t start, if that’s the first campaign that you’re launching, if you’re just starting off with Facebook ads, your first campaign shouldn’t be promoting the course because you don’t know what to be careful of. You don’t know what you need to pay attention to, how everything works and you actually don’t want to spend hundreds and hundreds of dollars investing into promoting the actual course but getting absolutely nothing back. You’re way better off if you invest, let’s say, $100 and generate leads to your email course, to any kind of lead magnet that you have because you can always reuse those leads, but if you spend $500 promoting your video course and you don’t get like even a sale, even a lead, nothing back, you’re left without anything. Jonathan: That’s true. In the course sector, there’s a lot of people, coaches, people that are using their experience to sell a course to a target audience in the health, fitness, life improvement field. But I understand that you’ve got to be very careful in the wording of your copy, in your adverts and it’s quite easy to have your adverts rejected. Have you got any insights about what people have got to be aware of in that area? Mojca: First of all, Facebook is being really careful about any kind of discrimination, even body shaming when we’re talking about fitness industry and healthcare industry. For example, we were so used of before and after photos, like, this is how Mojca looked like before and this is 3 weeks after she took our fitness, I don’t know, course, or whatever. They don’t allow that. You cannot advertise before and after photos, for example. If you do that, the best case scenario is that your ads are just not going to be approved and you’re going to be able to launch new ads. Worst case scenario though is they just delete all of your things and they, not only disapprove your ad, but you don’t have a Facebook advertising anymore. It’s deactivated and you cannot use it anymore. So that’s the worst case scenario. Jonathan: Can I just ask about that? So what I think you’re saying is you send them some adverts, they look at them and then they go, “Oh my God.” And then they go look at your Facebook page and maybe there were restrictions in the past, their position has changed and they look at your site and they think, “Oh my God.” And then they just cut you out. Mojca: Yes. So they deactivate your Facebook advertising account and you cannot advertise on Facebook anymore. Sometimes they even hide your Facebook page if you’re using inappropriate language and so on. In my opinion, I think that’s for the better because they’re trying to create a healthy advertising ecosystem where and a fair advertising ecosystem where the sleazy marketing tactics don’t work anymore. For example, one thing that they’re really paying attention to nowadays is also that what you’re advertising in the copy and in the visuals, it has to match the actual landing page, meaning, if I were advertising my Facebook ads video course, but the landing page would actually be for a fitness video course, they can disqualify and deactivate my Facebook advertising account because the product advertised on Facebook does not match the product on the landing page. So you have to be careful about that as well. What I do recommend for all new advertisers is to go through the advertising policies. Just skim through what’s allowed and what’s not allowed to get acquainted with all of their advertising policies so you don’t get yourself a deactivated advertising account. You don’t want that. Jonathan: And have you got some resources on your own site or in your course that goes through that Mojca? Mojca: I have a whole lesson on Facebook advertising policies and what we can do is I can set up a link with, because I have a document of advertising policies so I can send you the link to that document so your listeners can download that and just check that out. Jonathan: That would be really helpful Mojca. Thank you so much. Mojca: It’s shorter than Facebook’s version. Jonathan: I’m sure it’s a lot more spicy and interesting. I’ve read some of Facebook’s policy documents. They’ve induced me to a coma, but there we go. Cindy, got a question? Cindy: Well, you’ve talked about the course that you have a couple of times so I’d actually like to talk a little bit more about that in terms of your experience of being an online course creator. So can you just talk a little bit Mojca about how did you decide to create a course, what was the process like and what was that experience like of creating a course for the first time? So, I sat down and didn’t care about the format, but I just wrote down a ton of bullet points about what I need to teach people. And then, I kind of grouped all of those bullet points together by topics and those topics actually became modules and those bullet points became lessons. And that’s when I started to create my actual course and when I had the structure of it, I set up a landing page and I wanted to validate that product with my audience so I did a pre-launch and did my first 10K with that pre-launch, pre-launching my course and it felt really good. It was a lot less than I was used to with client work, but just the satisfaction of having own product and earning your first 10K with the course, it was really amazing and that’s when it was validated and I sat down and started creating the lessons and recording the lessons and I’m still recording the lessons, but the first feedback is just really amazing and really good and I cannot wait for this to be actually recorded in total so I can go and focus on marketing it more. Cindy: That’s a great story. I love the idea because your process sounds very sound and the idea of validating with your audience and everything before actually going in to spending all the time to make it work. And so, you validated it through just your own audience that you had? Is that the process that you kind of went through to kind of do that validation? Mojca: Yeah. So the number one reason why I did that was because none of my lessons were recorded and my audience knows me. They know that if they pay for a product and if I can see that, okay, it is getting some traction, I’m going to record the lessons. So they know that, but I wasn’t so sure that other people would know that, other people that don’t know me personally, that haven’t been a part of my audience for years. So I didn’t want to risk the sort of fake validation where they would purchase the course, but in 3 days they would say, “Yeah. I want the videos right now.” And they would ask for a refund. I didn’t want to experience that and that’s why I focused only on my audience. And now, after I finish, I am marketing the course a little bit here and there, but after I finish the actual course and when all of the lessons are recorded, I’m just going to focus on really marketing it to other audiences as well. Jonathan: I think it’s time to wrap it up for the podcast part of the show. Hopefully, Mojca will agree to stay on and we can have an additional chat which you can see on the WP-Tonic website and YouTube channel. Please subscribe to our YouTube channel and then you’ll be notified when new episodes of the WP-Tonic Show are put on the YouTube channel. So, Mojca, how can people find out more about you, what you’re up to and your course? Jonathan: Oh, that’s great. And we’ll make sure that’s all in the show notes folks. I highly recommend Mojca. She’s a real expert in social media. She’s worked with some of the top, I know some of the people that she’s worked with. She’s really got some great results and she’s extremely professional. Cindy, how can people find out more about you and what you’re up to Cindy? Cindy: Thanks, Jonathan. Mojca, thanks for coming on and offering resources to our audience. We really appreciate it. If people want to create a course just like Mojca was talking and you don’t know where to go or how to go about it, that’s kind of where I come in and help people and you can find me at TheCourseWhisperer.com. Jonathan: And if you want to build your course, your Learning Management System on WordPress or have some customization done to it and you don’t want to deal with all that technical stuff and you’re looking for a trusted resource, come to WP-Tonic, we can have a chat and we’ll help you build the course of your dreams, that’s what we like doing. Also, listeners and viewers, me and Cindy would love your feedback about what guests you would like us to get in the new year for you and what subjects and the areas that you’re really interested in and would like us to get special guests with insights in those areas. So there’s loads of ways of contacting us. You can go to the WP-Tonic website, the WP-Tonic Facebook, you can Twitter me or Cindy, but we would love your feedback about what you would like to hear next year. That would be great, wouldn’t it Cindy?